"It was assumed that the Aether is stationary with respect to the sun. The earth's orbital velocity around the sun is 30,000 m/s. Michelson-Morley expected to see this aether drift velocity, although it is 10,000 times slower than the velocity of light." Michelson-Morley did NOT find any Aether 'Drift'. Michelson and others looked for 50 years (Fabry-Perot, Mach-Zehnder, and Sagnac were the main ones). 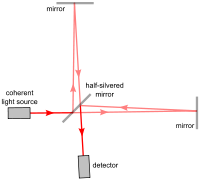 The device lays out the optics on a horizontal plane, comparing the x-axis light beam with the y-axis light beam, just like Michelson and Morley did 125 years ago. 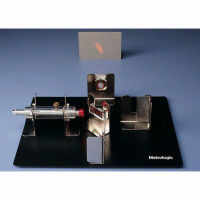 My test is with a Michelson Interferometer as shown below. I purchased this one (at the left) from Sargent-Welch.com. The device is manufactured by Metrologic, who makes product laser scanners for supermarkets and other retailers. The laser pointer is tuned to 635nm and is bright red, as is shown in the images below. "Duck-taped" a 1 inch thick book to the bottom of the plate, to provide more rigidity for the rotation motion. Added twice as much magnetic tape to all the brackets, to provide stability when in the vertical plane. Added L-brackets to hold the target screen, so that the screen was available at all angles of rotation. The preliminary testing generated the three images below. The effect is robust, and while the effect is modest, the fringe components are about quadruple in size, this change in size would have been vindication for Michelson. But the direction is different from where Michelson-Morley was looking and would probably have been a quandary for them. Just like modern day physicists. I draw your attention to the "fringe" element. The first picture (where the device is horizontal) the "width" (not the height) of the element is about 1 millimeter. The second picture is (where the device is tilted 45 degrees) the "width" of the element is about 3 millimeters. In the third picture, the "width" of the element is about 4 millimeters. As you know, the fringe is the result of the merged light rays being "out of sync". There are only two ways for this to happen. One way is for the path lengths to be slightly different. That is the case with the narrow fringe I got while the device is laying horizontal. The other way for this to happen is if the light rays in two merged paths are moving at different speeds. The only way for light (aether waves) to have different speeds, is for the horizontal path to be traveling "across" the aether flow, and the vertical path to be traveling "with" the aether flow. The four (4) hundred percent increase in fringe wave "thickness" is very strong evidence the rays in the two paths are moving at different speeds, which I interpret as "the Aether Drift" that Michelson spent 35 years looking for. This result is very significant. This device was designed (125 years ago) to detect an Aether flow. This evidence says YES, there is an Aether! And YES, there is a flow! And YES, it is in the vertical plane (z-axis). The implications are, at least, a problem with General Relativity insisting that the 'speed-of-light' is a constant. Also, there is a problem with General Relativity insisting that gravity is the result of a 'warping of space'. For an alternate discussion of gravity, look here.